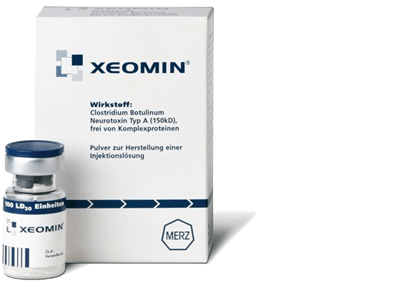 Xeomin is a botulinum toxin type-A (incobotulinumtoxinA) that blocks the release of a chemical messenger-acetylcholine-that conveys the signal from nerve terminals and causes muscle fibers to contract. Xeomin only contain active neurotoxins and are used to improve the look of moderate to severe frown lines between the eyebrows (glabellar lines). Xeomin are also used for abnormal spasm of the eyelids (blepharospasm) in adults who have had prior treatment with onabotulinumtoxinA Botox), abnormal head position and neck pain in adults with cervical dystonia and for increased muscle stiffness in the arm of adults with upper limb spasticity. Xeomin is also known as Bocouture.